Marjorie Barretto says she already taught her daughter Julia Barretto how to deal with online bashers. 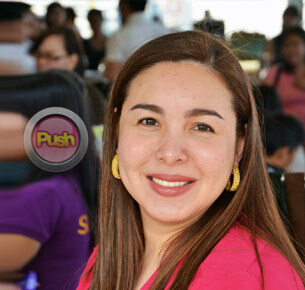 Marjorie Barretto admitted that she is not worried about her daughter Julia being too young to start her showbiz career. In fact, the Mirabella star has been getting offers for several years now. “Hindi na ako worried, she’s turning 17. She was getting offers since she was 12 or 13 and talagang lagi kong pinipigilan, nag-iiyakan kami dahil hindi ko siya pinapayagan. Until one day she said, ‘Mom, 16 na ako. Kelan mo pa ako papayagan?’ Oo nga naman, tumatanda na in show business 17 or 18 matanda ka na. I don’t think she’s starting young and I have equipped her well. She’s very mature for her age. She’s ready,” she said. Marjorie said that even with eight major endorsement deals, Julia is already showing that she can handle her finances. “Kuripot yan (laughs). Hindi niya ginagalaw ang [money from] endorsements niya, that’s kept. As in totally hindi galaw yun. It’s all intact. Ang ginagamit lang niya yung [money from] mga personal appearances niya, yung tapings niya pero all her endorsements walang nagagalaw dun kahit na ano,” she said. Marjorie said she raised all her children to be independent thinkers and respectful people despite any detractors. “I always tell my children definitely they cannot be bullies first and foremost. I don’t think I can also worry about my children being bullied because they have a really strong character, but not in a bad way. My kids don’t strike me as [sic] someone that can be bullied rin. But I always remind them, even my son, that I don’t like them to be bullies. Si Julia very strong girl nga siya eh, I don’t know nga why. Nakikita na lang niya siguro sa akin. I’m proud of her but I know kahit anong pa-mature niya, I know there’s a child in her and there will be times na hindi niya kakayanin or pagod na pagod siya and maybe there will be one basher will hit a raw nerve in her body, alam mo yun eh. I’ll allow her to be a kid that way. Sabi ko nga sa kanya na when there’s a new launch or a new showing ng teleserye or what, siguuro shy away muna from the internet world siguro. Sabi ko, ‘Alam mo yung mga mag-ba-bash sa iyo, yan ang mga nanunuod ng mga TV show mo (laughs)’” she said. With Julia all set to star in Mirabella, Marjorie said she has already advised her daughter on the intrigues that come with being a celebrity, especially since she is being paired with Enrique Gil. “She discussed it with me. When it first happens, you get hurt and then after a while you get immune. And then I always just tell my kids you just delete and block. Don’t give them the satisfaction of allowing them to hurt you. We don’t really discuss that too much kasi I don’t like give those bashers the satisfaction of hurting us. Sabi ko nga you can take criticism if you know it’s constructive. Meron naman kasing akala natin nag-ba-bash pero constructive naman yung sinasabi. So sabi ko dapat marunong yung mga anak ko. They can tell which one is constructive and which one is really destructive to them. Pag constructive take it, if there’s really something to be changed, improve on it. Pero pagka-ganyan alam mo naming inggit lang yung ginagawa nila, huwag mo na basahin. At saka immediately pag nakita mo yung pangalan na yun negative na, i-delete mo na, i-block mo na,” she explained. With Julia following in the footsteps of the Barretto sisters, Marjorie said she is confident that her other children will want to be in the limelight in the future as well. Julia is the second in her brood, but is her eldest child with Dennis Padilla (her eldest daughter Dani was her daughter with ex-boyfriend Kier Legaspi). “Right now, I don’t see anyone of them wanting to enter showbiz. Claudia is very promising but I think she wants to do more on commercials. Yung eldest ko si Dani hindi rin. Leon is too young and I don’t think I’ll be allowing him so right now it’s really Julia amongst all my children who really showed passion for showbiz,” she shared. The doting mom said her children showed how close-knit they could be when they decided to have a garage sale to raise funds for victims of Typhoon Yolanda. They were able to raise P135,000 which they handed over by check to Leyte 4th District Representative Lucy Torres-Gomez. “Kasi yung mga anak ko takot manuod ng news kasi they get depressed, they get affected. So ayaw nila and then they caught it one time and I told them they had to sit down and watch. Even if it depresses them they have to know that there’s something terribly wrong in another part of the country. Kung iiyak ka eh di umiyak ka. You have to see it. So they were watching and siyempre they felt so affected tapos maya maya umaakyat na sila. Naririnig mo na, ‘We’re going to sell clothes!’ so they started moving and I started doing my own move, naghanap na ako ng venue and all of that. Pag akyat ko ng dressing room, yung punong-puno naming dressing room siguro parang one fourth na lang ang natira. Sabi nga ni Julia, ‘Mom, you know I have to give ‘til it hurts.’ Kasi sabi ko sa kanya parang sayang yung iba bago pa, pero sabi niya, ‘Mom, it has to hurt’ (laughs) so sabi ko, ‘Okay, go!’” she recalled.